52 Years ago today, the Wham-O Toy Company introduced "The Pluto Platter." Two years prior to it's release, it was presented to Wham-O founders Arthur "Spud" Melin & Richard Knerr by it's inventor, Fred Morrison, a little known building inspector who, apparently, had been playing around with a plastic flying disc as he went from site to site and one day realized it would make a nice toy. Another story goes that Knerr and Melin saw Morrison playing with it on the beach and approached him. Either way, the Pluto Platter hit the stores. One year later, it underwent a name change to "Frisbee". Marketing genius at work, eh? 52 years later, "Let's go play Pluto Platter" wouldn't get anyone off the couch. "Let's throw the frisbee" sounds way cooler. Wham-O was known as a place where "garage tinkers could show up with wacky ideas and watch them turn into national fads in a matter of months." The Frisbee followed on the heels of the wildly popular Slingshot and was itself followed by the Hoola-Hoop, the "Grandaddy of all fads." The Hoola-Hoop originated as a bamboo ring Australian children used for exercise. In 1997, Wham-O introduced the Frisbee® disc Max Flight. 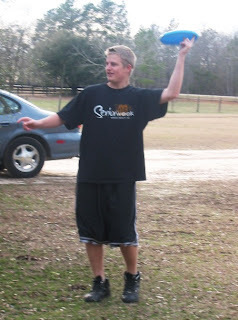 It was thrown & caught over 350 feet at the 1997 Frisbee U.S. Open Flying Disc Championships. Here we are 52 years later with a World Flying Disc Federation & and an entirely new sport: Disc Golf or Frisbee Golf, which my family has recently gotten into. Personally, as far as the greatest toys ever, I have to stick with the Mongo Bat. 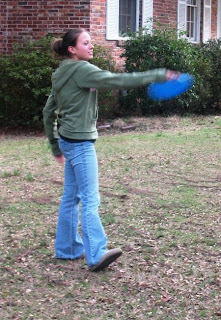 But I understand the appeal of the Frisbee, too, so versatile, almost unbreakable, and easy to transport. Go grab your Frisbee (everyone's got one) and have a great day!